In Podcast 98 we discussed the idea of encouraging the community to help each other. As we have said on many occasions we aren’t the only Pro Tools Experts, it works best when we pull together as a community to help each other when and where we can. There are plenty of places on the web for trolls and negativity, if that’s you style then the Pro Tools Expert community may not be for you. Many of our members work hard to create a positive and supportive community of Pro Tools Experts and we think that kind of attitude should be recognised and encouraged. With all of that in mind we would like to reward those in the community who go the extra mile to help others. A single post helping a community member with a problem on the main site or on our Facebook page. A great video demonstrating a tip or trick in a new way. A collection of smaller posts all with the aim of helping the community. In the first podcast of each month we will announce the award from the previous month and explain why we have chosen that individual. We will post the story with a picture and details of the winner as we do with other competition winners. As this award is sponsored by Sonnox the winner each month will be able to choose one Native plug-in from the Sonnox Elite Collection. The item is download only, you must have an iLok account to use this software. Pro Tools Team members will not be included in this award. 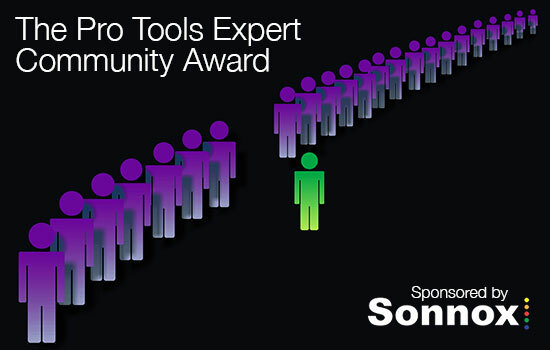 While Sonnox is pleased to be sponsoring this award, it has no other involvement; Sonnox in no way endorses or encourages any individual comment or view submitted on Pro Tools Expert.